Eastleigh Local Plan: The moment of truth has arrived. And truth is… there’s still not enough evidence! ADD UPDATE, 3 December 2017: On Friday night, Eastleigh Borough Council (EBC) published its proposed Local Plan. 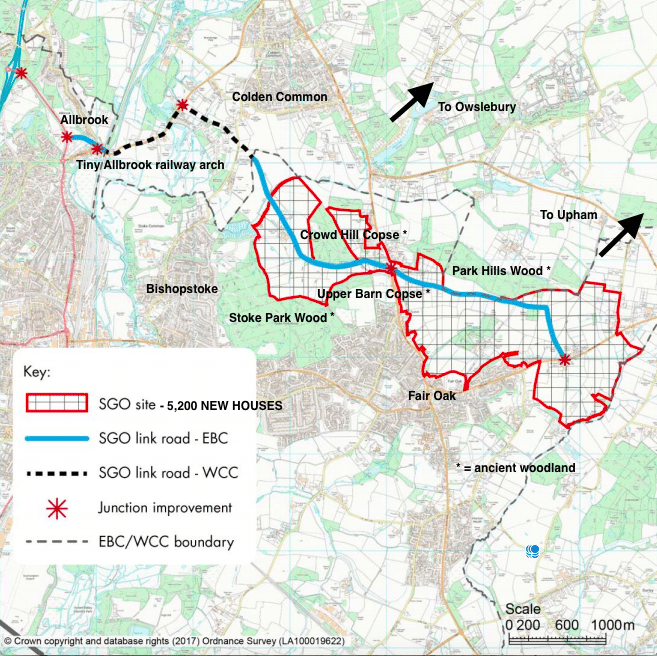 As we have long predicted (not least because the council has so clearly signalled), the plan involves building 5,200 new houses and a new link road north of Bishopstoke and Fair Oak and south of Colden Common, Owslebury and Upham, significantly affecting Allbrook, Boyatt Wood, Chandler’s Ford, Otterbourne, Brambridge, Highbridge, Twyford, Chandler’s Ford and Bishop’s Waltham too (the council’s options B and C – see an annotated EBC map above). To read all the papers, click here. The experienced team at ADD, together with our professional advisers, are currently combing through every detail of the council’s plan. It’s clear the council is still short of much critical evidence and that certain important myths, carefully crafted over the last few years, have taken hold. We will outline our full objections in the next few days. As we have stated from the beginning, all we want is a fully evidence-based Local Plan for Eastleigh. The council’s plan, by their own admission, is NOT evidence-based and is therefore full of ifs and buts. As regards transport modelling, paragraph 1.2.2 of the traffic report (appendix 11) by SYSTRA, the international engineering and consulting group, notes that there will be “significant /severe traffic congestion impacts” occurring from the combination of the new road and 5,200 new houses. In following paragraphs, SYSTRA traffic engineers say they are still searching for solutions to the congestion B and C will cause. Their initial suggestions only attempt to address problems within Eastleigh itself. 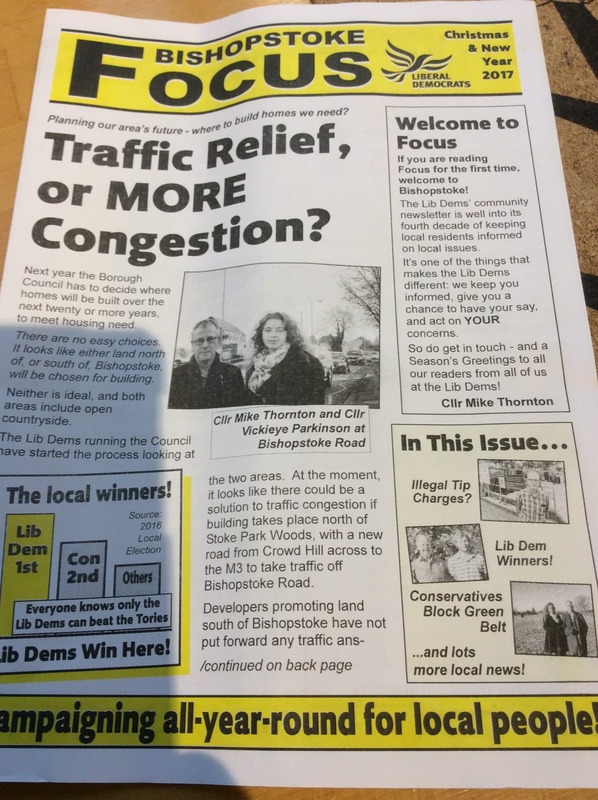 They do not mention the already severe traffic issues of Colden Common, Twyford, Upham and Owslebury. This is not surprising to us, although it must be a major disappointment to Eastleigh’s leaders who have hailed the new road as providing “a solution to take traffic off Bishopstoke Road”. The traffic engineers’ first report was delivered just before the 20 July full council meeting. After more than four months, and presumably intense pressure to deliver a solution, they have still not come up with a viable and effective set of ‘patches’ for the problem. Given the only justification for this scheme is this new road, SYSTRA’s findings are a massive hole in the heart of the Local Plan proposals. The Local Plan Advisor clearly believes, like the rest of us, that the council is still short of sufficient evidence to decide on its Plan. However, despite previous commitments by Councillor House, leader of the council, and other councillors, that they should wait on making a decision until all the required evidence is available, the council is now being asked to approve a scheme – options B and C – before that evidence is available! Whilst the ADD team works hard to analyse these plans, we ask one thing of the many of you who oppose them. That is – please – to turn up to the council’s meeting at 7pm on Monday 11 December at the Hilton at the Ageas Bowl (SO30 3XH), at which we anticipate councillors will – unbelievably – vote in favour of this flawed plan (despite the huge outstanding holes). Next year a planning inspector will have to scrutinise Eastleigh’s Local Plan. Whilst it will already be clear to this inspector (whoever he or she may be) that there is vast opposition, locally and nationally, to the council’s intentions (and the council’s decision-making is totally unsound), it would be excellent to demonstrate our opposition again on 11 December. Please, please do come. And bring all your friends and family with you! Together we will win this battle – but only if we stick together! Your ticket for the: Eastleigh Local Plan: The moment of truth has arrived. And truth is… there’s still not enough evidence!